I agree 100% with what you said about the Flamingos. About two years ago when Zeke was alive they appeared on Staten Island at what I believe was the Lane Theater. Doug McClure, who is now a preacher in Conn. but who had sung with them from the late 50's til the mid 70's and had not seen Zeke in 25 yrs. found out that they were singing nearby and surprised Zeke by showing up at the theatre for afternoon practice. I don't know if he actually sang at all with them in the afternoon but at night during the concert Zeke stopped the show in the middle of his performance to recognize Doug. He then called him onto the stage and had Doug do his lead on I'll be Home. I'm dead serious. It was a religious experience. My date was crying her eyes out and people all over the theater were reaching for handkerchiefs. 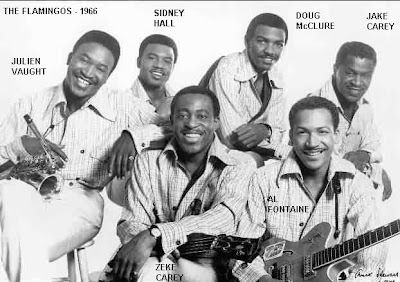 I have often wondered since Zeke, the last original died shortly after Doo Wop 50, if anyone has tried to get McClure back with the group for special appearances. I'm going to have to get some video tapes of their performances. Unca Marvy's history of the Flamingos (where I found the above picture) mentions that "Sometime after those sessions [in March 1963 for The Sound of the Flamingos], they added tenor Doug McClure to make a sextet of singers again." Steve Walker says of a Doug McClure lead: "In the spring of 1964 the Flamingos returned to Checker for a few sides. They recorded an incredible Latin-rhythmed version of Oscar Hammerstein's 'Lover Come Back to Me' that would have established a whole new legion of Flamingos followers had radio given it a chance to be heard." Doug McLure's myspace page promoting his Love Letters CD allows you to listen to his jazz-tinged new recording of I Only Have Eyes For You.